After the Grand Opening of the Mammoth Lakes Trail System on October 20, 2012, we took a look back at everything this community has accomplished over the previous six years to not only establish a Mammoth Lakes Trail System, but to also enhance all recreation opportunities here in Mammoth Lakes. ...haven't we all been busy! Click here to find out who, what, when, where and why! Mammoth Trails is a confederation of outdoor recreation user groups in Mammoth Lakes who have come together to collaboratively address recreation opportunities, issues, and stewardship in our community. 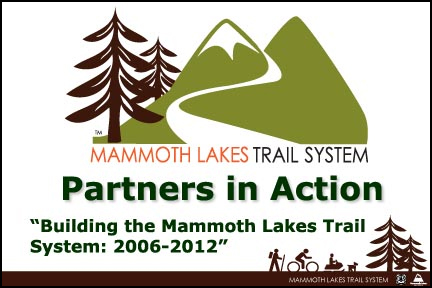 Are you part of an organization that should be a member of Mammoth Trails? Download the Mammoth Trails Charter to see if Mammoth Trails looks right for your group, club, agency, or enterprise. Send us an e-mail if you have further questions.